LOCAL COMERCIAL. ANTES HOSTELERÍA. 1429 M2. EN PLENO CASCO HISTÓRICO DE ZARAGOZA. SALIDA A VARIAS CALLES. MUCHAS POSIBILIDADES. INMUEBLE SISTUADO A POCOS METROS DE PASO DAMAS Y SAN IGNACIO DE LOYOLA EN ZONA DE GRAN TRANSITO Y MUY COMERCIAL. ÚLTIMA OCUPACIÓN COMO ENTIDAD BANCARIA. INSTALACIONES ELECTRICIDAD Y CLIMATIZACION COMPLETAS. LOCAL 230 M2 UTILES EN UNA SOLA PLANTA. EN ZONA MUY COMERCIAL DE CUARTE EN EL BULEVAR JUNTO AL AYUNTAMIENTO. 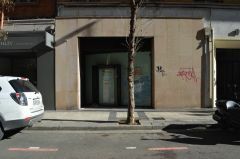 FACHADA COMERCIAL 8 METROS LINEALES. LOCAL ACONDICIONADO. VALIDO CUALQUIER ACTIVIDAD, SALIDA DE HUMOS.